Police officers were forced to shoot three pit bulls that were viciously attacking a man and his small dog in downtown Los Angeles. A passerby was trying to save the dog, and police attempted to scare the pit bulls off using batons and a water hose but the three dogs would not release their grip of the man’s small pet. 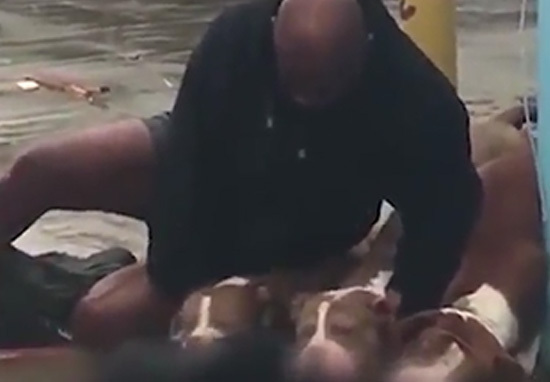 The shocking footage shows a man, believed to be the owner, trying to wrestle the pit bulls which seem intent on savaging the small pet. Police then resort to shooting the dogs, which are originally bred for fighting and no countries except Canada and the U.S allow the importation of pit bull type dogs. The attack took place at about 8.30am when a man in his 50s was walking his dog and was attacked by the viscous animals. The three dogs mawled the small pet dog to death and the owner was taken to hospital for treatment of multiple dog bites.